NEW YORK (CNS) — Moviegoers with long memories may recall director Terence Young’s 1967 adaptation of Frederick Knott’s play “Wait Until Dark” in which Audrey Hepburn portrayed a blind housewife forced to defend herself against three sighted thugs. The film’s premise — involving a doll stuffed with heroin that Hepburn’s character, Susy Hendrix, had innocently come into possession of — may have been flimsy. But the confrontations to which it led, in which Susy proved remarkably resourceful at tilting the battlefield against her adversaries, had viewers in danger of slipping off their seats. 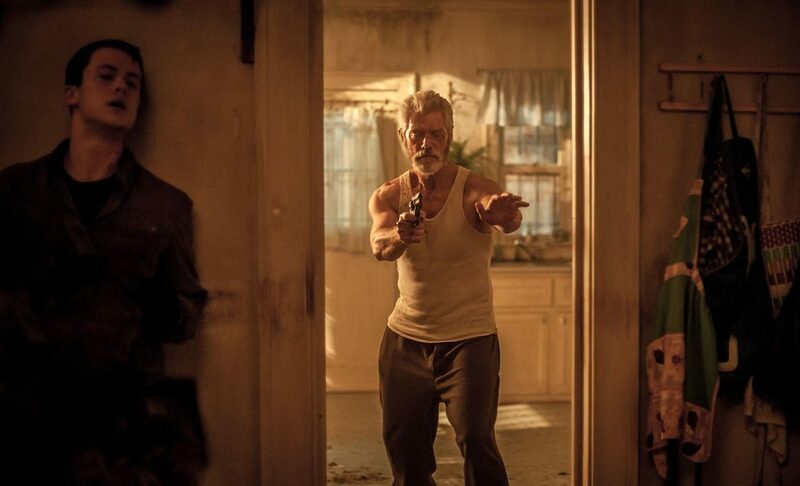 Lo, the years have passed, and director and co-writer Fede Alvarez’s generally effective but sometimes nasty thriller, “Don’t Breathe” (Screen Gems), turns out to have a great deal more in common with Young’s movie than just a title in the imperative mood. Once again we have a trio of home invaders, this time made up of youthful friends — and partners in petty crime — Rocky (Jane Levy), Alex (Dylan Minnette) and Money (Daniel Zovatto). And once more there is a sightless victim waiting in the wings in the person of a reclusive veteran (Stephen Lang) which the script, penned with Rodo Sayagues, never names. As the purloining pals quickly discover, though, their supposedly easy mark is no Audrey Hepburn, intrepid or otherwise. A sympathetic figure in theory — he’s been targeted by the burgling buddies because of a large legal settlement he was awarded after his young daughter was killed by a reckless driver — he’s actually a homicidal loon with well-honed combat skills. Add to that the fact that his house is the only inhabited dwelling in an abandoned area of Detroit, and that it’s watched over by a ferocious guard dog, and it’s pretty clear just how soon the tables will be turned on the amateurish thieves. Alvarez is fairly restrained in his presentation of the mayhem that follows. Though blood flows, it’s measurable in ounces not bucket loads. Yet, as the action progresses plot developments begin to strain the laws of logic. More significantly, perverse behavior and the horror equivalent of gross-out humor creep in — and creep out the audience in a way those seeking casual entertainment are unlikely to appreciate. The film contains intense violence with some gore, a disturbing sequence involving a bizarre sexual assault, brief scatological humor, a couple of uses of profanity, much rough and crude language and an obscene gesture. The Catholic News Service classification is L — limited adult audience, films whose problematic content many adults would find troubling. The Motion Picture Association of America rating is R — restricted. Under 17 requires accompanying parent or adult guardian.